HI All, just a note to say I am just about to start travelling again. If Possible I will put updates on this trip as it happens.. So starting in Tehran . I have been twice before and look forward to seeing more of Iran this time. So shortly you will see my reports . Africa-South Sudan-Juba I had spend some time organising my visa for South Sudan. I ended up getting it in Nairobi. Organising anything in Juba took ages. With flights changing and being cancelled. In the end it was fine. Some roads were good, others non existent . It is also quite expensive to visit hotel and food wise. 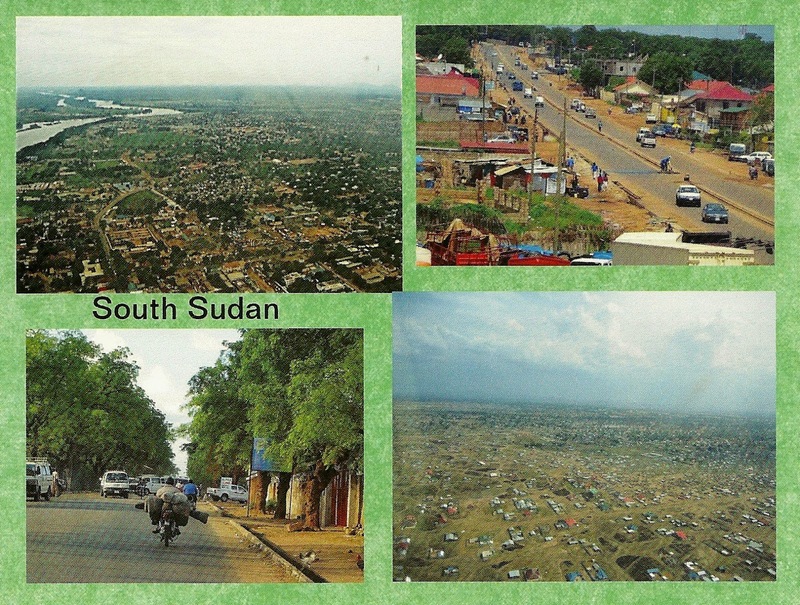 I had purchased the postcards in advance as there were no Postcards for sale in Juba. I did try for my own information. Also the Post office is not known. The hotel told me there was no Post office and that everyone uses DHL. The Post office was friendly and they had to find the key to get the stamps. I only got this card last week. So that is over 5 months. I did send two batches as all the mail goes over via Khartoum in Sudan. Africa-Kenya-Nairobi I was a little bit concerned going to Nairobi as I was told it was a dangerous city from a tourist point of view. I was careful as usual and found no issues. There was a lot of security around . The city is modern compared to other African capitals. Not so much to see here . I did mention Security. I nearly got arrested for taking photos of the Main Post office. I had to go to the head of security and explain why I would want to take a photo of a post office. Luckily all ended well. The Philatelic section charge a Tax charge on stamps as they believe they are not for postage. I had to pay more and was told that if I just wanted postage stamps well then I could go to the stamp counter. Unfortunately these Anniversary of Independence stamps were only available at the Philatelic Counter. Africa-Kenya-Masi Mara This was the key reason for my trip to Kenya, the Masi Mara. It is wonderful and even better then I had thought. It was my second safari , the other being Botswana. But this was better and my first time to see lions up close. Pretty amazing this trip and stayed in a tented rooms in the Masi Mara. One of those trips you never forget. 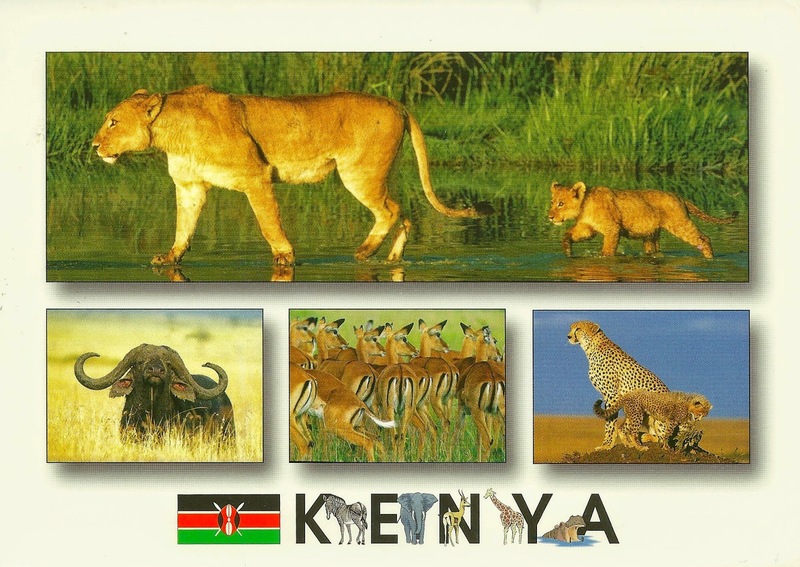 Sad to say there is no Post office near the area of Masi Mara I stayed or even a Postbox. 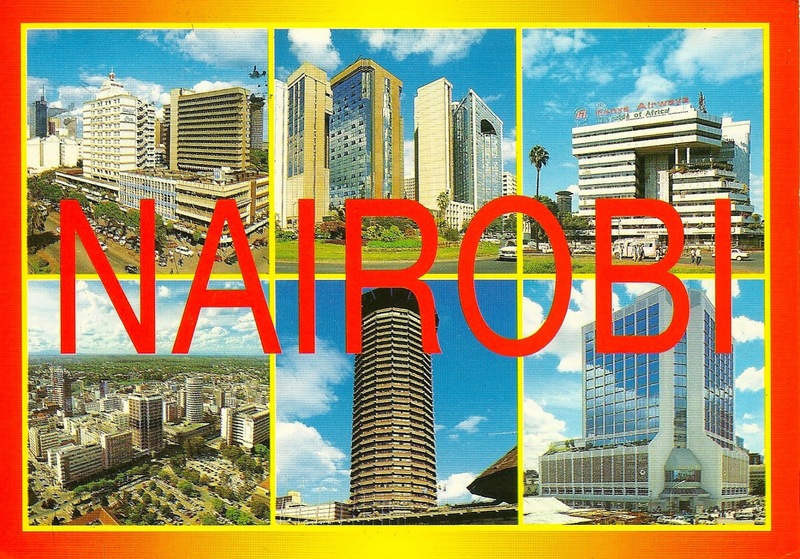 So I took my card back to Nairobi to mail back home. 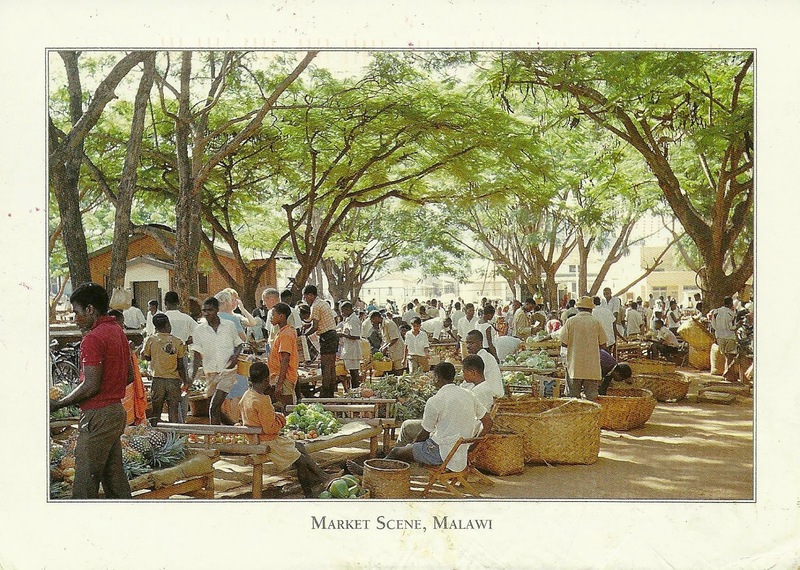 Africa-Malawi-Blantyre Finding a suitable postcard in Blantyre was like trying to find Hens Teeth. Malawi felt even poorer then Burundi in parts. Again every one was very friendly and in Blantyre there were a good number of nice hotels. Explored the National Park and it was a great preview for the next trip to Kenya. Always lots to see in daily life on the way around the country. The main Post office in Blantyre had a nice show cabinet with stamps, but when I got to the counter they had only this stamp available. It was a large Post office but staff were not very interested in doing too much work. In saying that in some countries they run out of stamps, so one has to be grateful to get what is available. Africa-Malawi-Lake Malawi Pure heaven here. Well worth the bad roads , but great scenery. The sand was very nice as was the very welcoming owners of this place. Plenty of R and R before the next busy trip to Kenya. Lake Malawi is a World Heritage Site. The nearest Post office to the area on Lake Malawi was Monkey Bay. The Post office was closed when I got there so this went into the letter box outside. Africa-Burundi-Bujumbura It is not often I put a card up here from a hotel , but this was a very nice hotel on lake Tanganyika. A lot of French soldiers on leave staying here. It was worth having some time out from this hectic African trip. Posted this card in the main Post office in Bujumbura. The ladies there at the counter were eager to please and show what stamps they had. 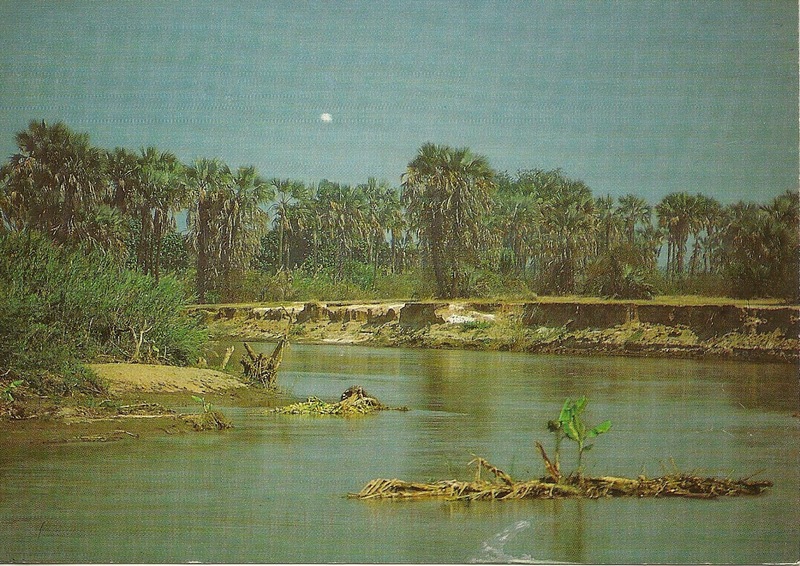 Africa-Burundi-Bujumbura Here is photo of a lake . Bujumbura is a very interesting city to visit. It is full of life and busy. I did not see any other Europeans walking around the city, so was very careful . Had a wonderful meal near the lake with great service and a full choice. Prices here very low. Africa-Rwanda-Kigali Kigali is quite a hilly city. Coming to here from Uganda you could not but think of the civil war that was here. My first visit was to the Genocide museum. This was very powerful and a good starting point to understand what when on here. I had read a few books on this so was very interested. Rwanda is a small and quite crowed place. Africa-Rwanda-Huye This is a Waterbuck . You will see many of these in Rwanda. 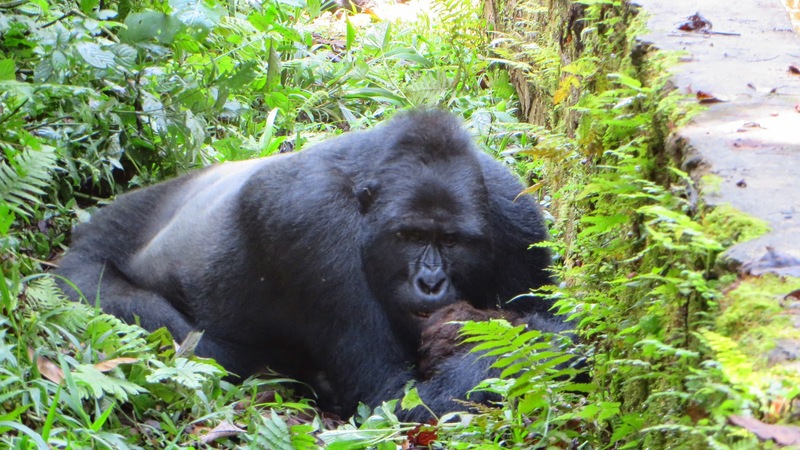 Rwanda is very well known for the Mountain Gorillas here. 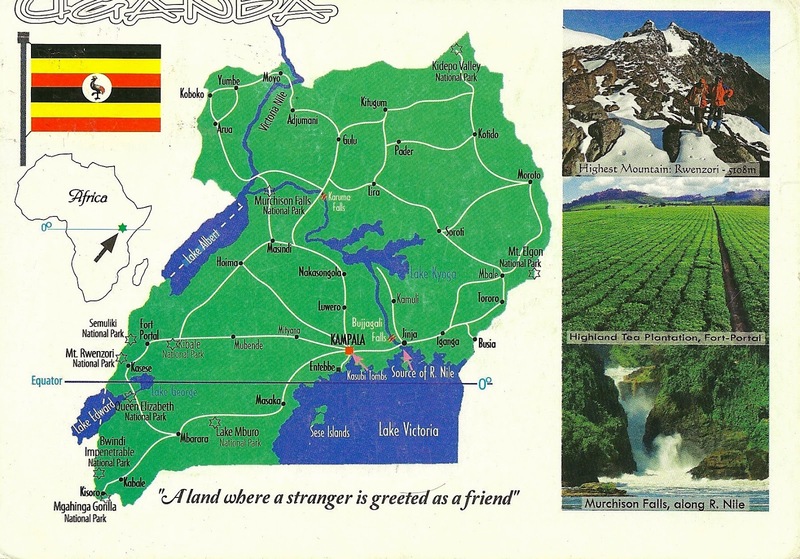 This area is right on the border with Uganda. They are easier to see here then Uganda and the road access is better from the airport. But had seen them in Uganda so gave that a miss. By the way the permit to see Gorillas is USD 500 in Uganda and USD 750 in Rwanda. At least that way the local village people gain from making sure the Gorillas are minded and cared for. 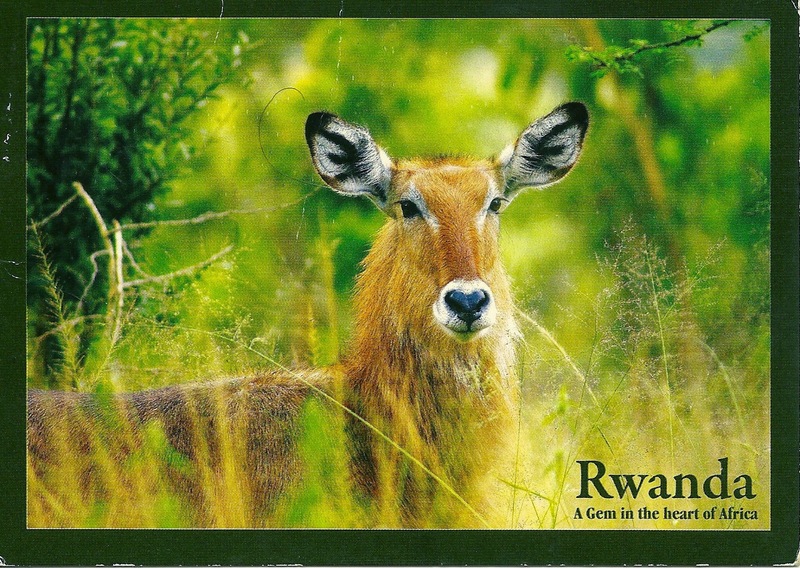 These are the definitive stamps from Rwanda . 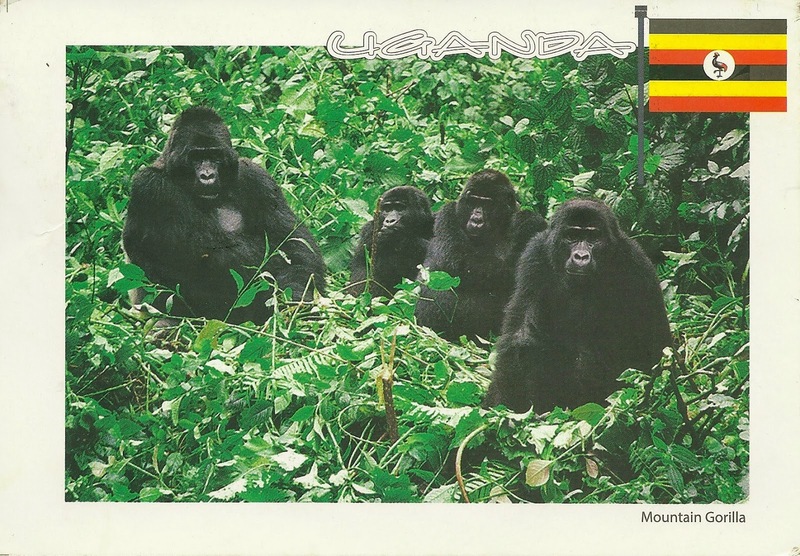 Africa-Uganda-Bwindi National Park Certainly the highlight of any trip to Uganda is to see the Gorillas. It took about 2/3 hours to find them. There were rangers and spotters who know were they usually are. So amazing and one of the wonders of the world to see them in the wild. A wonderful World Heritage Site. There was a no post office near the park. 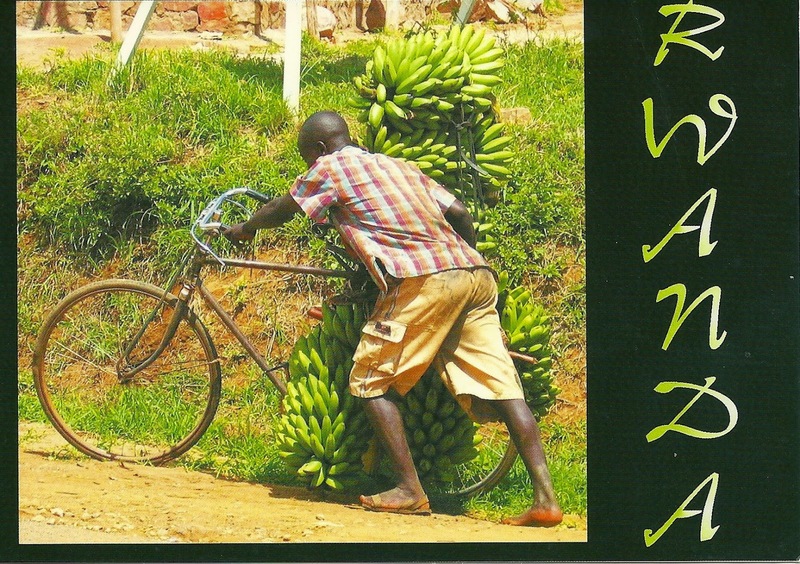 So this card was posted on the way to Rwanda at a Border town Post office. The Main Post office was very large and had a small philatelic section. However the official in charge had the keys and was off that day I visited. So only had a limited selection. Africa-Uganda-Kampala Many African cities are not very attractive. Kampala it pretty colourful and a busy city. I found it very safe to walk around . Loved this triangular stamp that had just been recently issued. 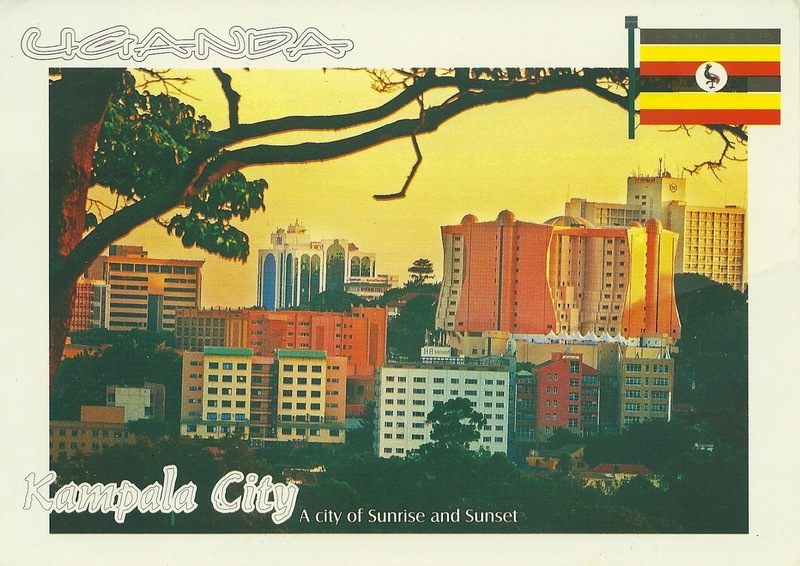 Clear postmark with Kampala sorting office. 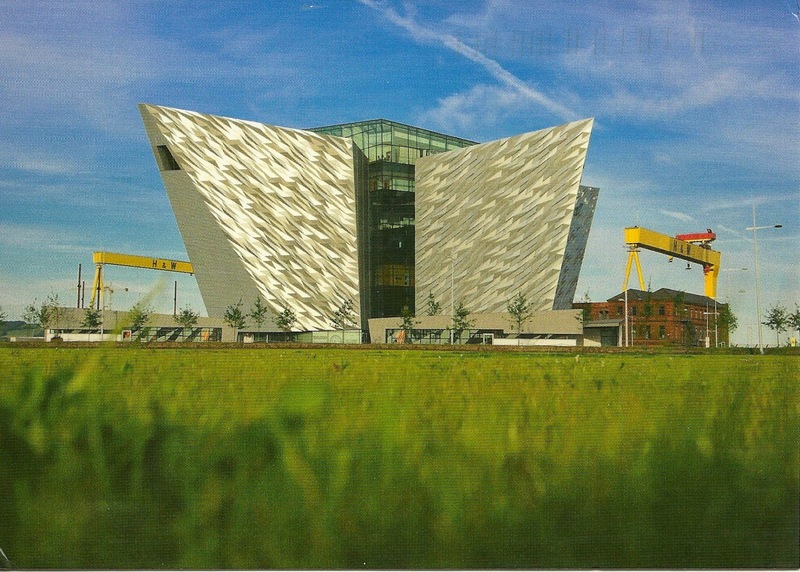 United Kingdom-Northern Ireland-Belfast This is the new Titanic Museum in Belfast . It is fantastic and well worth the visit. I spend a good few hours and still did not have enough time. This is where the iconic Titanic was built. This is a United Kingdom Christmas stamp . I did not put a Northern Ireland stamp on this card as they have been on previous issues. The Post office had no selection of stamps so just had to do with this one. Pacific Ocean-Tonga-Vava'u-Neiafu This island is one of the main tourist attractions in Tonga, especially with those who have Yachts. The scenery was special but best seen from the air on the flight across. A very small wooden post office but busy with post restante. The stamp shows the previous King George who died suddenly. Pacific Ocean-Wallis & Futuna-Matu Utu Well I have to say I never knew the capital of Wallis Futuna I until I was coming here. A small village I would call it. During my stay here , it was during the mini Pacific Games and the island was busy by their standards. Stayed at a wonderful small hotel near the airport with a great chief owner. The food alone was worth the trip. The main tourist attraction is the quiteness of the place and the unusual brick churches which are all over the island of Futuna. The Philatelic Bureau here is certainly one of the best I have ever visited. It has a fantastic wall display and its own office not far from the Post office. Room to sit and admire the stamps. So 10 out of 10 on that score and they do have wonderful stamps. 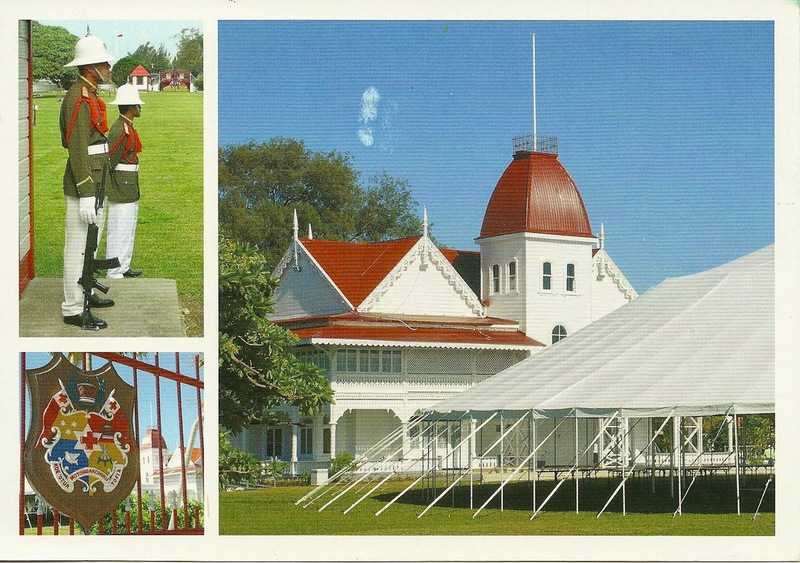 Pacific Ocean-Tonga-Nuku'alofa Here you can see the Royal Palace. It is must be one of the few if only Palaces made of Wood in the world that is still in use. It is right on the ocean front and easy to see, but surrounded by a fence. This is the main Island which contains the capital Nuku'alofa. The Post office in Nuku'alofa is quite large and even includes a cafe. But the Stamp counter is sort of outside and you have to look at the many stamps in a glass case on the wall. Here is one of the new issue famous Banana stamps that Tonga issued many years ago. I have a set in my collection. Tonga and Sierra Leone was one of the first countries in the world to issue self adhesive stamps that are now in common use . Pacific Ocean-Fiji-Suva I had not planned to visit Suva, but was here due to the non event in Tokelau. It rains quite a bit in the capital city and it was no exception during my stay here. Suva does not have a lot to offer as a capital city , but did visit the Fiji Museum which is interesting. There was some stamps in the Post office, but not a great selection and no Philatelic sales counter. 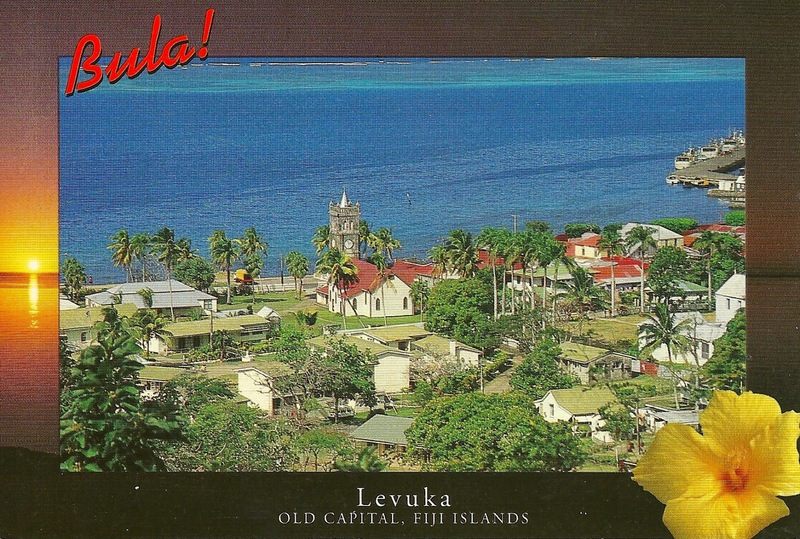 Pacific Ocean-Fiji-Levuka The first capital of Fiji . A Island east of the main Fiji Island. Got here by the once a day flight. It is a charming town and a World Heritage site at that. Really felt I had gone back in time. Stayed in old Colonial Hotel , perhaps the oldest in Fiji. A great island to visit. The Post office here was busy and nice to see a local postmark. 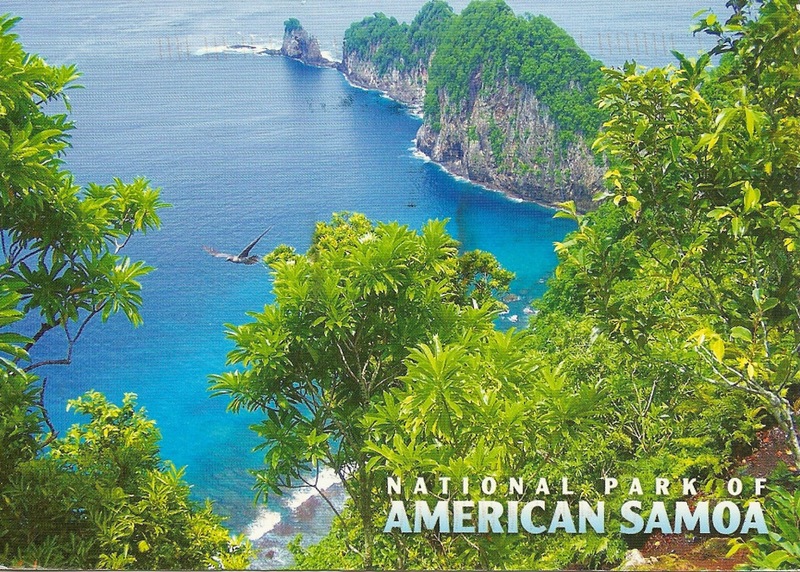 Pacific Ocean-American Samoa-Pago Pago American Samoa is one of those places that before I go expect it to be a poor version of Samoa. It is different ok, with plenty of usual fare shops and fast food places. But it has a wonderful harbour and a fantastic National Park. Enjoyed my stay here and great food too. The fun thing was getting here too, the airline charges by the weight of the passengers. So all the heavy people go on the other airline.. More room on this small plane for everyone. 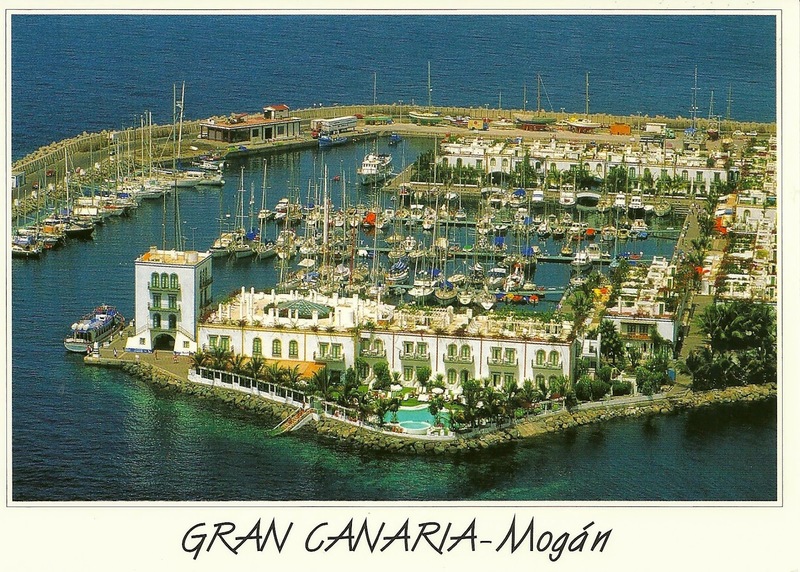 This Postcard is not as simple as it looks. Due to my flight changing back and forward to go back to Samoa I could not mail this in the Post office. At the time I visited the Post office I could not find a suitable card. So when I did it was closed. I have my cards to the receptionist at the hotel. I did get the card back but with no postmark. So I ended up telephoning the Postal officer in Pago Pago and we had a chat on the phone. So I then sent the card back by registered mail and here it is cancelled. Pacific Ocean-Samoa-Apia My second time here . It had progressed big time . I got out around the Island and had a famous Weightlifter as the driver.. I cant remember his name now? 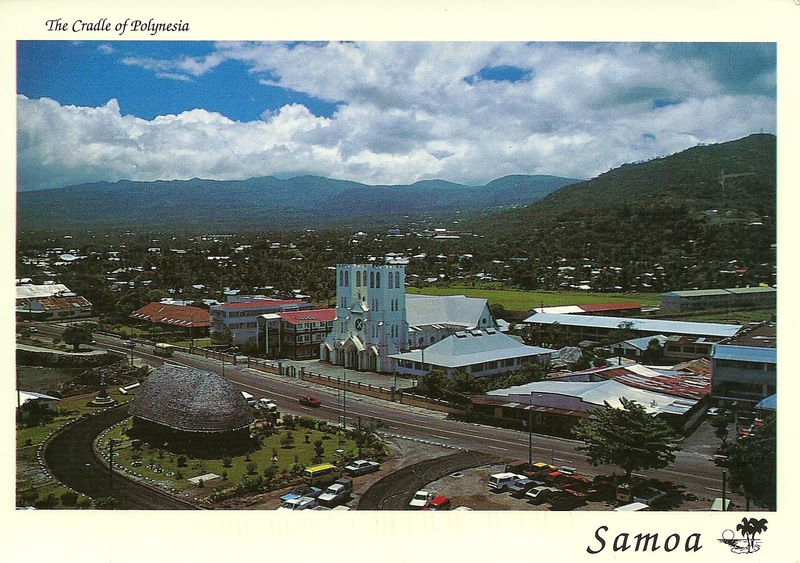 Samoa was also my start point for my trip to Tokelau . But it never happened as the ship left early . So I will be back here again. Tokelau is due to get a new faster ship next year. So I look forward to getting back . The General Post Office had a full Philatelic section with glass displays in the centre. Pacific Ocean-Fiji-Yanuca Island It was great to be back here after all these years. Last time in 1983. Same hotel. 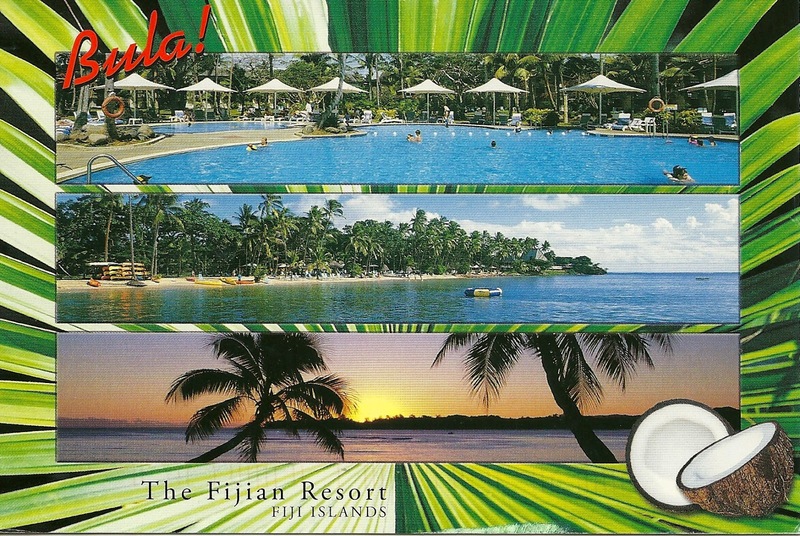 Fiji was still as welcoming as ever with the famous word "Bula" = Hello everywhere you went. 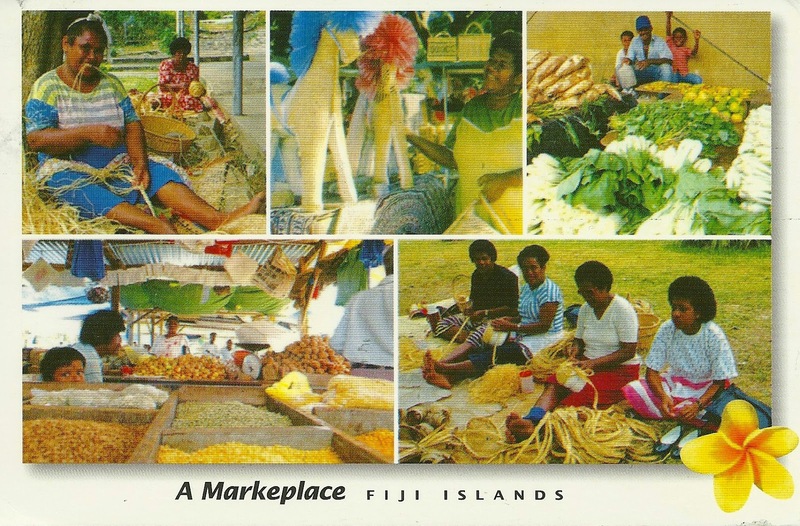 I had seen a lot of Fiji over the years so in one sense all the exploration had been done. Still nice to relax after the long flight from Europe and the busy trip to Christmas Island. 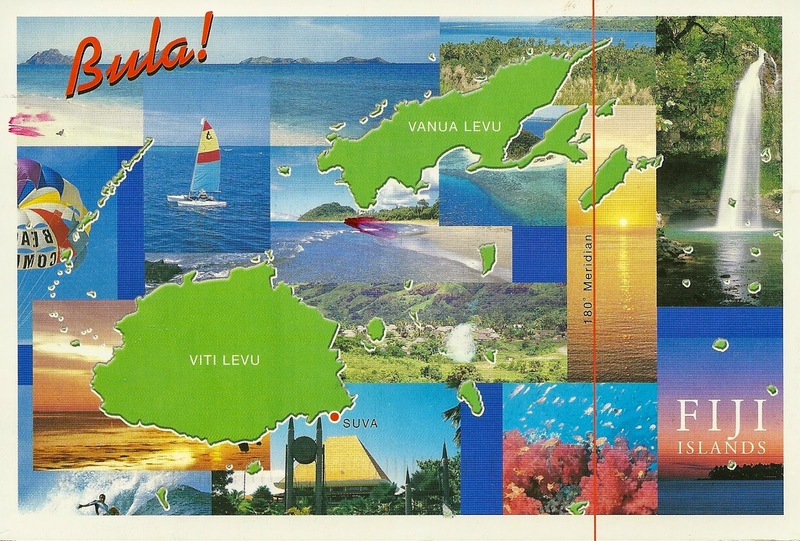 This Postcard was posted in the main post office in Nadi in Singatoka , which is not too far from the hotel. Pacific Ocean-Fiji-Port Denarau This area is very near Nadi the international airport in Fiji. It is very necessary to stop over in Fiji if you are planning on going to many countries in the Pacific, unless you are flying from Australia or New Zealand. This area had only been developed since the mid 1980s so was new to me. There was a Post office in Port Denarau so mailed this here, Even though it has a Nadi postmark. 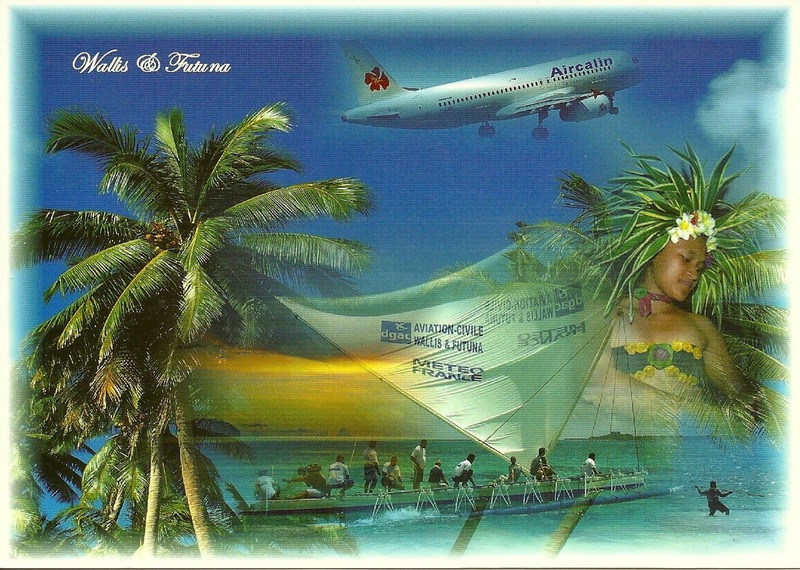 Pacific Ocean-Line & Phoenix Islands-Christmas Island Also known as Kiritimati. The T in local language is pronounced as a s. During my early travels around the Pacific in the early 1980s I had visited some of the Gilbert Islands which has changed the country name to Kiribati. They were quite crowed as all were small atolls. I had never made it to Christmas Island as the flights were via Honolulu and were not always going. So on this time I arranged to fly up from Fiji . Christmas Island is the largest Atoll in the world. It is a fantastic sight as you come into land. Full of bird life and much larger then I had even realised. The little Post office was in the Line and Phoenix Government offices lot. I had arranged a driver and tour to get around the island. So one of the stops of course was the Post office. When I got here it was closed. So spend a few minutes trying to find out where the official was. When the lady turned up, she was very helpful . They sold Postcards and Stamps . I like the postmark. Pacific Ocean-Line & Phoenix Islands-Kiritimati Also known as Christmas Island. Not to be confused with the Christmas Island owned by Australia in the Indian Ocean. 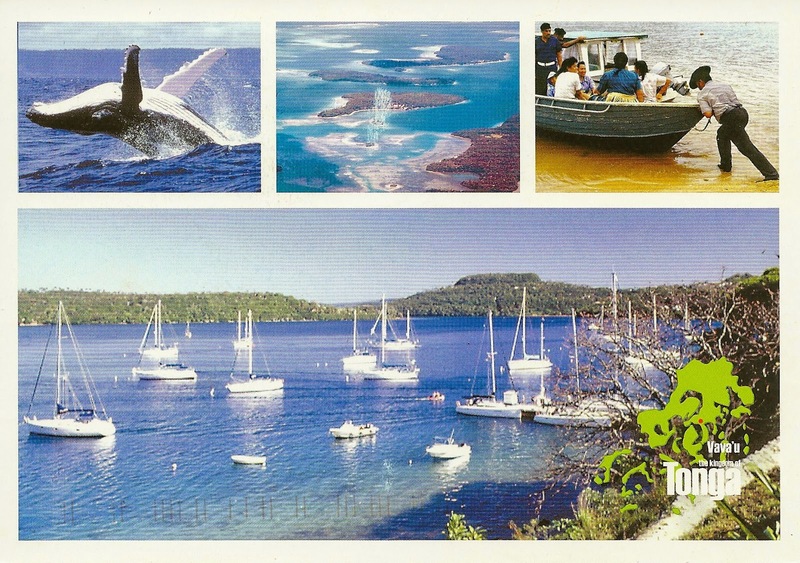 This postcard shows glimpses of the wonderful scenery on this island. The area where the beach was is amazing with beautiful white soft sand . All my friends and I skinny dipped that day as there was no one about. We also got lots of Bird photos. To finish off we had local Crayfish which was fab. A great trip to Kirimati and back to Fiji . I was a little disappointed that the Post office only had Definitive stamps. The reason is that Tarawa the capital of Kiribati is so far away and there is no direct connection between the two. There is one hotel here the Captain Cook as the island was discovered on Christmas Day by Captain Cook.